The restaurant industry is an entry point for many low income, recently immigrated, or those with a love of food, a secret family recipe, or have hosted a string of successful dinner parties. During the 2008 recession, pop-up restaurants grew in popularity as under employed chefs or recently unemployed workers sought new avenues to sell food by renting out space in existing restaurants or even hosting dinners in places not designed to be a restaurant like car garages and office spaces. 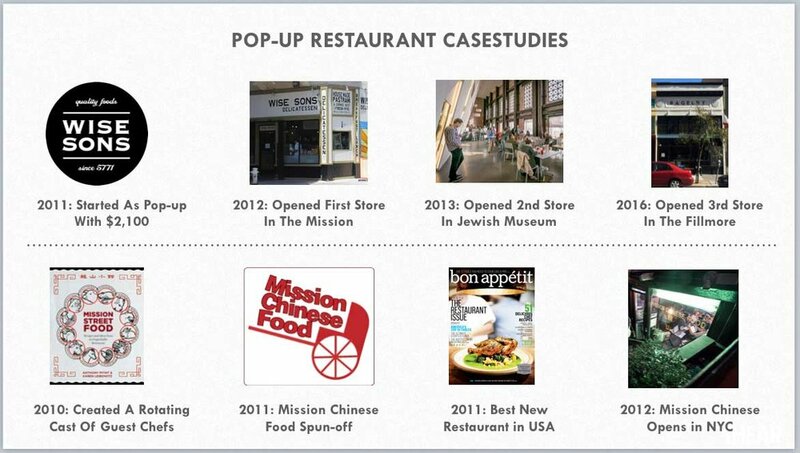 Pop-ups grew into a low cost testing ground for aspiring restaurateurs ($2,000 vs. $500,000+) to get in the game. Pop-ups provide a low cost way for chefs / restauranteurs to try new menu concepts in a low-cost way. Starting a restaurant typically requires a $500-1 Mil investment, while a pop-up can usually be produced for less than $500. In the Web 2.0 world, developing a strong social media following is a key to success. Chef / Restauranteurs use pop-ups to build buzz and engagement with their target audiences which they can then leverage for a future brick and mortar. In the end, dollars matter. The pop-up restaurant series will allow future chefs / restauranteurs to learn from valuable financial data points making them stronger prospective investors, lenders, and land lords. To prepare our chefs / restauranteurs for success, we offer valuable skill-set building workshops thru our partner Renaissance. Successful concepts will be referred to a more intensive suite of consulting that will provide them with free branding, marketing, legal services, and more. Designed for chefs with full-time jobs, short-term engagements allow chefs to exercise their skills for small one-off events. Short-term engagements also allows Kultivate Labs to test concepts prior to committing to a long run and preventing the possibility of tying up the space with a concept that hasn't begun to resonate with the general public. All short-term pop-ups will receive personalized coaching from Chef Tim Luym to ensure the operational viability of their concepts. Pop-ups will also receive skill-set building courses including accounting and social media training from Renaissance. Chefs that have a successful short-term engagement can be invited back for a longer run so they can generate more revenue, perfect their concept, and gain additional traction with the general public. Pop-ups that reach this level will be referred to Renaissance’s business acceleration program for customized consulting including branding and financial modeling to better prepare them for success outside of the pop-up scene. Truly exceptional pop-ups can extend their terms to 3 months if there is a high level of public demand or if they are raising funds and interest from investors for a long-term lease. Pop-ups that reach this level will be referred to Renaissance’s business acceleration program for intensive consulting on areas including finance, crowdfunding, or lease negotiations.